Dhaka Ahsania Mission (DAM) founded in 1958 with the motto “Divine and Humanitarian Service” and core values of humanity, spirituality, humility, equality and equity, caring for nature, honesty and morality. DAM has Consultative Status (Special Category) with UN ECOSOC, operational relation with UNESCO, associate status with UNDP, WFP and UNICEF. As a value based organization DAM envisions holistic and spiritual development for wellbeing of the human community and care for nature. Considering the post-2015 era of global development, DAM has developed its organizational 10 years Strategy Plan 2015-2025 aiming to improve the living condition of the vulnerable people and resilience building. DAM’s Sectoral focus has given in three core sectors Education, Health and Economic Development. These three core sectors are complemented by TVET in the education, WASH in the health and Agriculture in the economic development sector. From rights perspective Rights and Governance sector is a crosscutting sector. Climate Change (CC) and Disaster Risk Reduction (DRR) being have implications on all development initiatives and work as another crosscutting sector. DAM’s identity as a “mission for change’ in living conditions integrating divine values and providing high quality services to the people and strengthen leadership capacity across DAM. Based on the organizational strategic plan, CC & DRR sector has developed its guiding framework for implementing the program as cross cut sector for next decade. The plan focuses continue the comprehensive all hazard, all risk and all sector approach for reducing the vulnerability & poverty. The CC & DRR sector has four major program components: Climate Change Adaptation and Disaster Preparedness, Strengthening Mitigation Measures, Restoration & Conservation of Biodiversity and Eco-System, Emergency Response and Recovery. The focus has given more on humanitarian issues in the response and recovery program and also be prepared to deal with any emergency, which lies with the organizational motto.DAM has been developed its Humanitarian Strategy Plan 2015-2025 integrated the Core Humanitarian Standard (CHS) issues . Moreover, the plan intend the DM Act, DM Policy & Plan, SOD and guidelines of Bangladesh Government for ‘reinforcing’ the plan to get support in order to effectively and authoritatively achieve objectives of the plan that are deemed important. The strategic direction is formulated based on the global, regional and national context analysis, leading to strategic issues, change objectives and millstone. The ongoing four-stroke programme implementation strategy of DAM is continued having Community capacity building, Institutional capacity building, Policy advocacy and Direct services as four distinct but complementing wings of the strategy. Ganokendra (People’s centre) like community based platforms are promoted more in support of community capacity building. DAM performs emergency endeavours in its operational areas on priority basis and usually in the normal time, it’s tested through the Emergency Response Plan. DAM has intensive experience of disaster management since 1988 and undertaken short, medium and long-term response & rehabilitation activities in 1991 cyclone, flood 2004, flood 2007, Cyclone Sidr 2007, Cyclone AILA 2009, Rana plaza tragedy 2015, flood 2016 and cold wave responses. 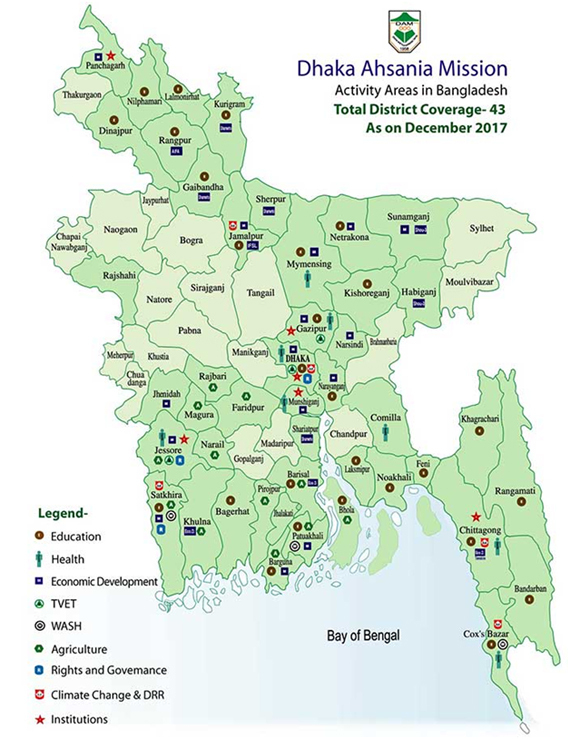 In 2017, DAM was engaged in Northeast (haor) and northwest flood and currently is supporting Rohingya settlers with healthcare & psychosocial care, Child Friendly Space and WASH. Also, DAM is leading the National Alliance of Humanitarian Actors in Bangladesh (NAHAB) as Chair of Ad-hoc Committee and member of Disaster Forum, NIRAPAD, Health ,WASH and Education Cluster. DAM’s current program operation areas are divided into eight division of Bangladesh e.g. poverty stricken northern districts, Middle-east riverine & haor districts, central riverine chars districts, south western districts including the Sundarbans, south and south-east coastal districts, hill districts and urban municipal areas. The current geographic coverage of DAM is in 43 districts and 183 Upazillas and direct reach to 3,836,808 populations as of June 2017. DAM’s current geographical focus is the location with high concentration of poverty and disadvantaged groups of population and remote locations. It further concentrate investment in areas with high climatic and environmental risk, smaller growth centers and towns with limited services and care, and existing locations with high disaster risk. It continues to monitor the changes in current east-west divide in the distribution of poverty and invest in the north-west part of the country that remains the poorest region of Bangladesh. DAM utilizes this dominant macro-analysis as it is very likely to have pockets of poverty within relatively well-off regions. In selected locations, based on the needs and feasibility, the DAM institutional services are being expanded gradually. Currently DAM is working in 43 districts and 155 Upazillas of 8 divisions. DAM visualizes a society that fosters humanity, spirituality, humility, equality and caring the nature. DAM provides high quality services towards unity, peace and development of social and spiritual life for the human community in general and for the disadvantaged and suffering humanity, in particular. 43 districts and 155 Upazillas, 8 division.